Christian Jacobs, 5, of Hertford, North Carolina, dressed as a Marine, pauses at his father's gravestone on Memorial Day at Arlington National Cemetery in Arlington, Virginia. on May 30, 2016. Since 1971, when the U.S. Congress declared Memorial Day a national federal holiday, Americans have spent the final Monday in May honoring all who died during military service throughout U.S. history. But it all began in 1865, just after the end of the Civil War, when a group of freed American slaves held what came to be seen as the first commemoration of the nation's war dead. According to historical accounts, in an expression of gratitude to those who died fighting against slavery, the freed slaves exhumed the bodies of more than 250 Union soldiers from a mass grave at a Confederate prison camp in Charleston, South Carolina, and gave them a proper burial. A few weeks later, about 10,000 people marched on May 1 to commemorate the war dead. In 1868, the commemoration become known officially as Decoration Day, a day to clean up and place flowers on the graves of the war dead. Two decades later, U.S. states had adopted it as an official holiday. But for more than 50 years, the holiday only remembered those killed in the Civil War, not in any other American conflict. It wasn’t until America’s entry into World War One that the tradition was expanded to include those killed in all wars. 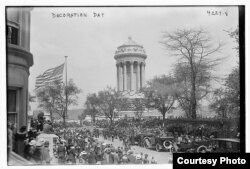 What is now celebrated as Memorial Day was not officially recognized nationwide until that act of Congress in 1971. Nearly, thirty years later, in 2000, Congress passed the National Moment of Remembrance Act, encouraging all citizens to pause for a minute of silence each year on Memorial Day to remember those who sacrificed their lives in all American military conflicts.